There are plenty of articles focused on teaching how to market to millennials. Yet very few articles have explored Generation Z — the up and coming generation. According to The New York Times, this generation numbers roughly 69 million individuals! Plus, they have a spending power of $43 billion. These numbers would suggest that businesses should start taking notice. So, how do you start marketing content to the first generation of digital natives? In this article, we’ll cover a couple of winning strategies. A 2015 study by Defy, found that 13-24 year olds prefer watching video content on Youtube rather than TV. They favor interactive videos from relatable, authentic personalities instead of pre-recorded TV shows. Examples include digital stars like Bethany Mota and Felix Kjelberg. Bethany speaks to her 10 million Youtube followers about her fashion hauls, outfits, and life experiences. How do you get started building your own personal brand through video content? First and foremost, Facebook recently launched Facebook Live, which makes it easier than ever to create online video content. For the effort of saving time, I’ll refer you to here, here and here. If you need an example of live videos done well, then look no further than Benefit Cosmetics. 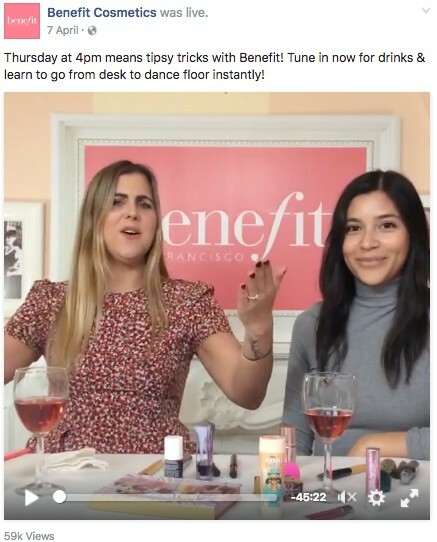 Their live video series called Tipsy Tricks features hosts who chat with their audience about life, fashion, and makeup. They also show viewers how to use their products. Regularly ask your audience questions. They will be able to respond in the Facebook comments section. Answer your viewer’s questions as if you’re face to face with them. This gives the video a more natural feel. Many businesses have social media accounts, but rarely update them. What’s worse, is sometimes the only reason they ever post anything is to promote a product or sale. Businesses that lack a social presence or hold back from personal interaction with their customers are missing out on a great opportunity. Generation Z is glued to their social media accounts. Facebook, Snapchat, Instagram, and Twitter are used regularly. Given this, how do you create an ideal social media presence? Get Generation Z involved! Encourage them to take selfies with your product on Instagram, or tag your business while they are visiting. They appreciate not only the product being offered but the experience as well. According to Interactions, a marketing firm based in San Diego, members of Generation Z look for products that provide them an experience and instant gratification. For example, Taco Bell’s Snapchat campaign. 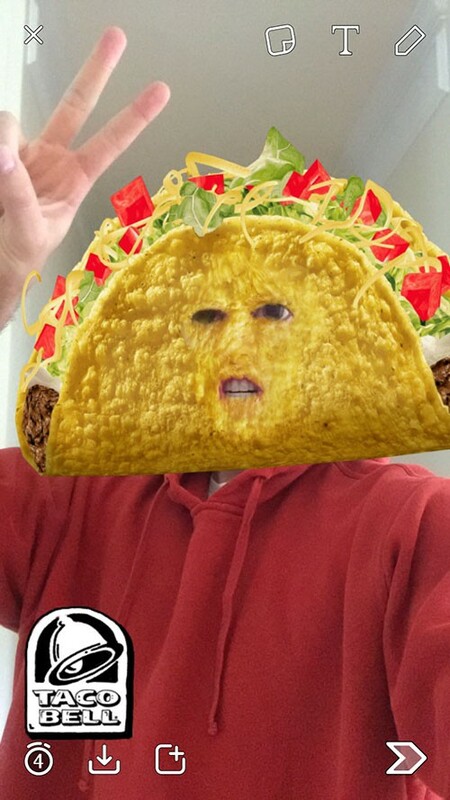 Taco Bell launched a filter that turns a person’s head into a taco. It sounds silly (trust me, it was), but it amassed 224 Million views in a day. It resulted in people posting the taco-faced snaps online and sharing them with their friends. That is way more cost effective than a $20,000 TV advertisement! Who would you trust more? The words of a friend or a corporation? If you’re like most people, you’re far more likely to believe a friend than a stranger. In fact, a study by Deep Focus found that Generation Z is more influenced by regular people than celebrities. This is where word of mouth advertising comes in. For example, you may notice a new cafe has recently opened on your social media timeline via a friends post. They highly recommend it. Compare this with the experience of watching a classic TV promotion for the same cafe. Which option is more likely to get you to go to the cafe? By extension, how can you encourage to word-of-mouth advertising like this? This simple approach exposes potential new customers to your brand and content. According to research, Generation Z has an 8 second filter. This probably explains the logic behind Twitter (140 characters) and Snapchat (5-10 second videos). Unlike their parents, Generation Z is offered unlimited possibilities in terms of content. In fact, they are exposed to 200,000 marketing messages a day! Their short attention spans may be attributed to the lack of time they have to read all these messages. Given this scenario, how would you market your content to this generation? Generation Z may have short attention spans, but that doesn’t mean they can’t finish a 10 minute read. Just be sure you’re creating interesting and relevant marketing content. For instance, if you’re brand is a tech startup promoting a virtual reality product, show customers the product through short Snapchat videos, GIFs, memes, and images. Do not get dismissed as boring! How Will You Market to Generation Z? When it comes to marketing content for generation Z, the bottom-line is authenticity. Create entertaining GIFs and relatable articles. When posting social videos, use a conversational tone. Spontaneity and entertainment is key. When in doubt, you can always start with user generated content! Monique Danao is a freelance writer, content creator and copywriter with expertise in tech, food and digital marketing. When she's not creating her next big article, you'll find her enjoying funky food, listening to music, stalking startups and researching updates on tech. You may contact her through her website or follow her on Twitter.